Scientists have figured out why the most massive extinction occurred in the seas of the Earth. Computer modeling has shown how this can happen again and what threatens us. Scientists are considering the possibility of a second “Great Extinction.” The first, as researchers believe, was due to the increased volcanic activity in the area of ​​today’s Siberia. Due to volcanic emissions, the atmosphere of the planet was filled with a critical amount of greenhouse gases. The problem is that now the Earth can again play a similar scenario, at least in the sea. Previously, it was not known why the “Great Extinction” turned out to be so devastating for marine organisms. According to the Daily Mail, scientists have found a possible clue. 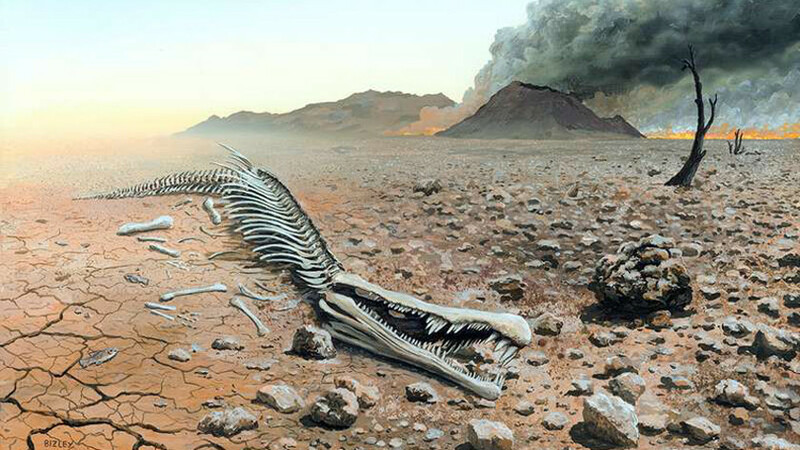 The “Great Extinction” occurred at the end of the Permian period, 252 million years ago. It destroyed more than 96% of marine species, 73% of terrestrial vertebrate species and, for the only time in the history of our planet, 83% of insect species. Because of such a comprehensive “stripping” of the entire living biosphere, it was restored very long and hard, unlike other extinctions (there were five of them during the existence of the planet). Why did extinction hit the sea animals the most? The fact is that warming caused the gradual heating of water in the oceans. And warm water cannot hold the amount of oxygen necessary for the life of most animals. The problem is that now the oceans are gradually warming. Scientists warn: by 2100 water heating will reach 20% of the Permian temperatures, and this process will continue. By the year 2300, it can reach 50%, but the speed strongly depends on how quickly the overall warming process develops. Computer simulation has shown that if the level of greenhouse gases reaches the level reached by the Earth’s atmosphere before the Great Extinction, the oceans will warm by about 10 degrees. This will cause a loss of approximately 80% oxygen. Most modern marine species cannot exist in such conditions. The most active ones to flee and die will be species adapted to cold and oxygen-rich waters. Abrupt changes in marine biota will inevitably affect terrestrial species. However, with this level of greenhouse gases, they will have enough of their own problems. Scientists note the contribution of anthropogenic sources of pollution. “This study underscores the potential for mass extinction associated with a similar mechanism in anthropogenic climate change,” says lead researcher, Dr. Justin Penn. The data of computer simulation is confirmed by the results of paleontological finds and studies. Dr. Penn and his co-authors note that for the first time they managed to obtain a model that made the calculations, which were fully confirmed in the study of fossil fossils and geological sediments. “This allows us to make predictions about the causes of extinction in the future,” says the scientist.